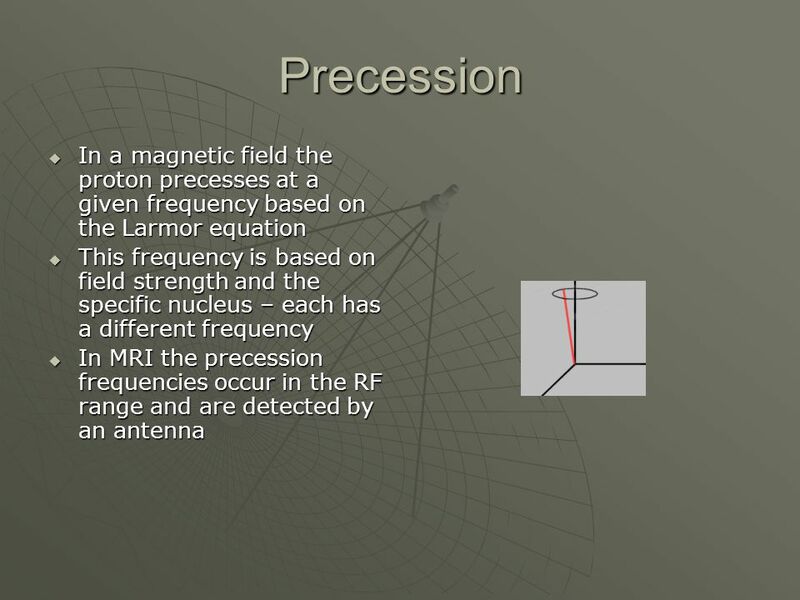 15 Figure 1. 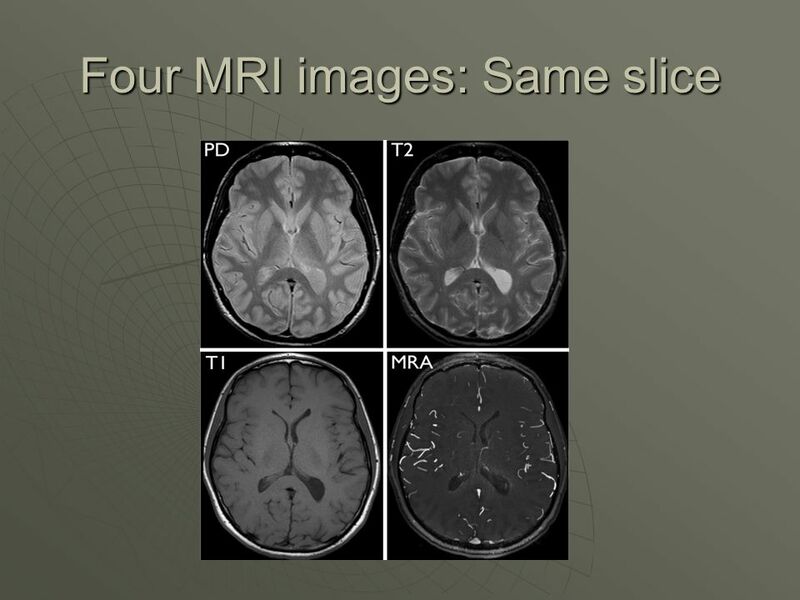 Representative axial brain images of the eight patients with ACA infarctions. 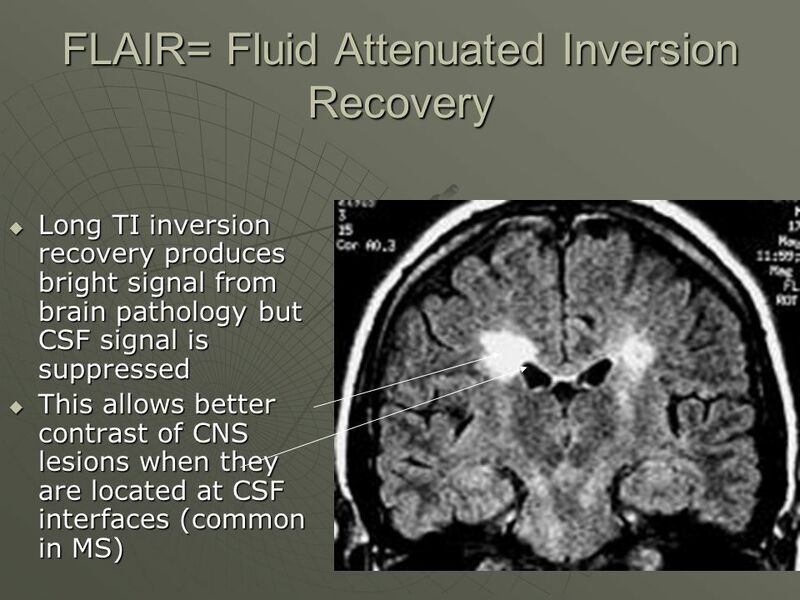 Patient numbers appear in the upper left corner of each panel. 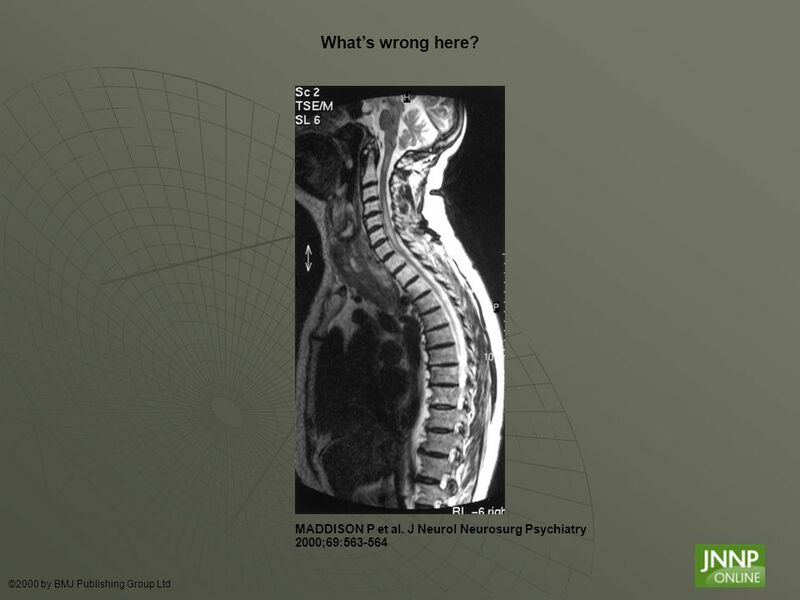 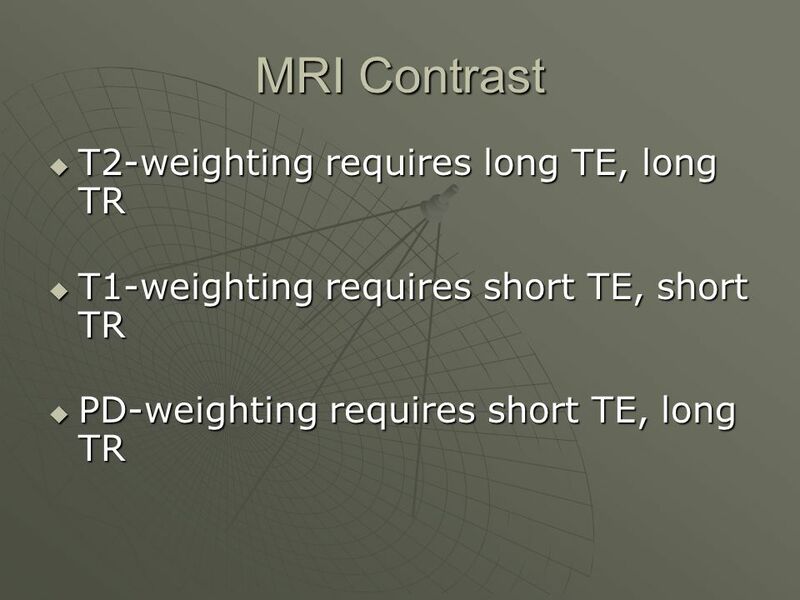 Patient 1, T1-weighted axial MRI; patient 2, CT scan; patient 3, T2-weighted MRI; patient 4, T1-weighted MRI; patient 5, proton density MRI; patient 6, CT scan; patient 7, T2-weighted MRI; and patient 8, T2-weighted MRI. 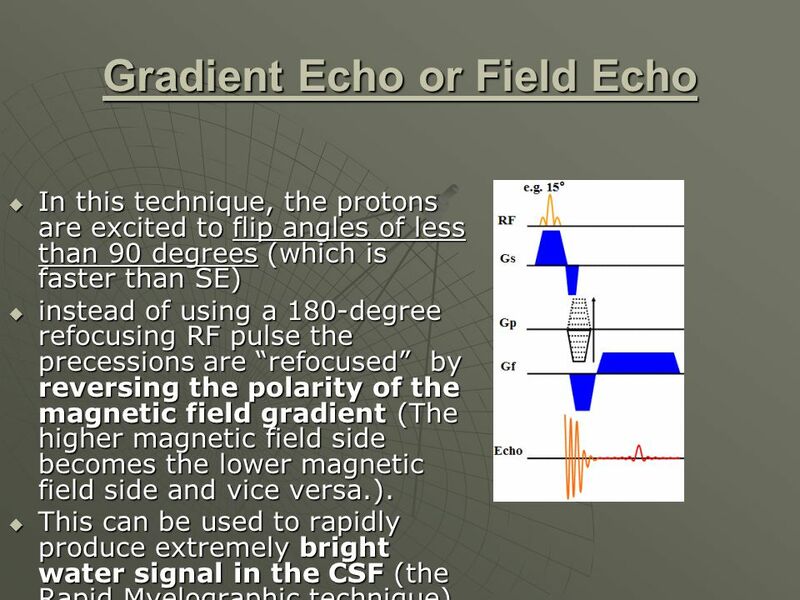 In this technique, the protons are excited to flip angles of less than 90 degrees (which is faster than SE) instead of using a 180-degree refocusing RF pulse the precessions are “refocused” by reversing the polarity of the magnetic field gradient (The higher magnetic field side becomes the lower magnetic field side and vice versa.). 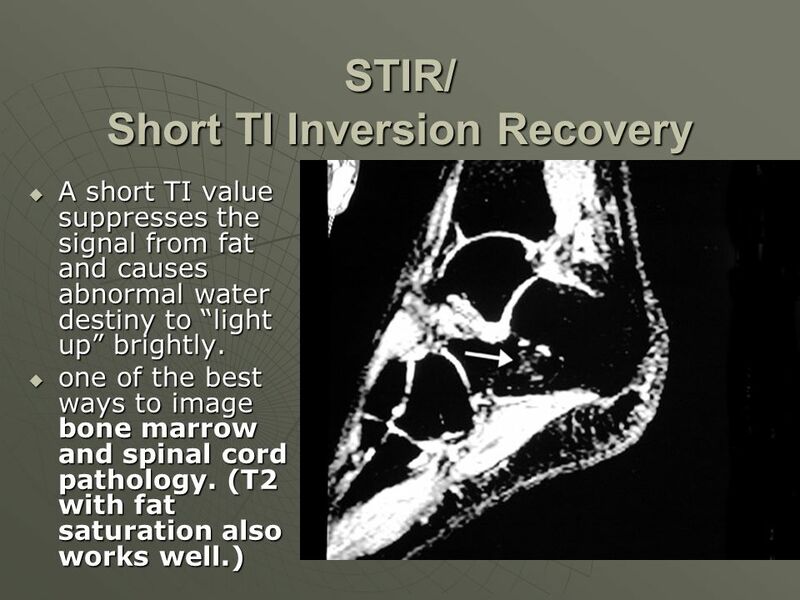 This can be used to rapidly produce extremely bright water signal in the CSF (the Rapid Myelographic technique) or in synovial fluid. 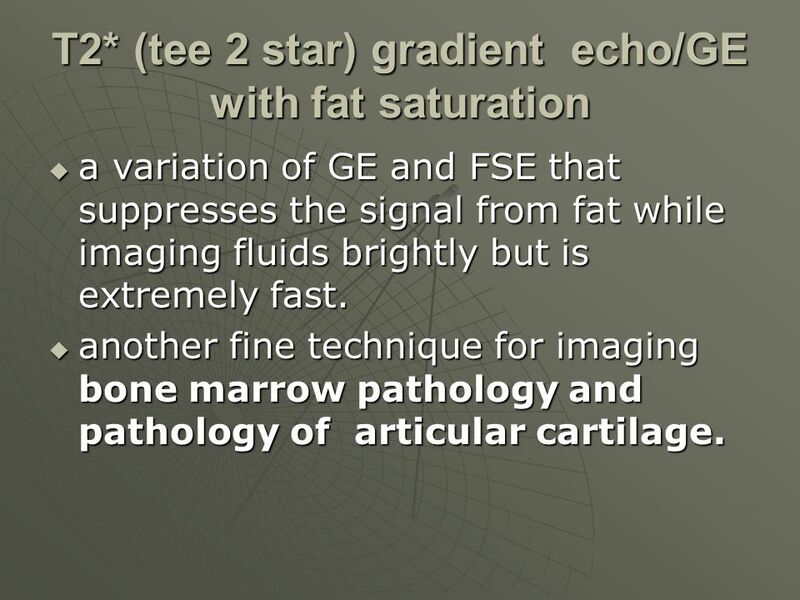 a variation of GE and FSE that suppresses the signal from fat while imaging fluids brightly but is extremely fast. 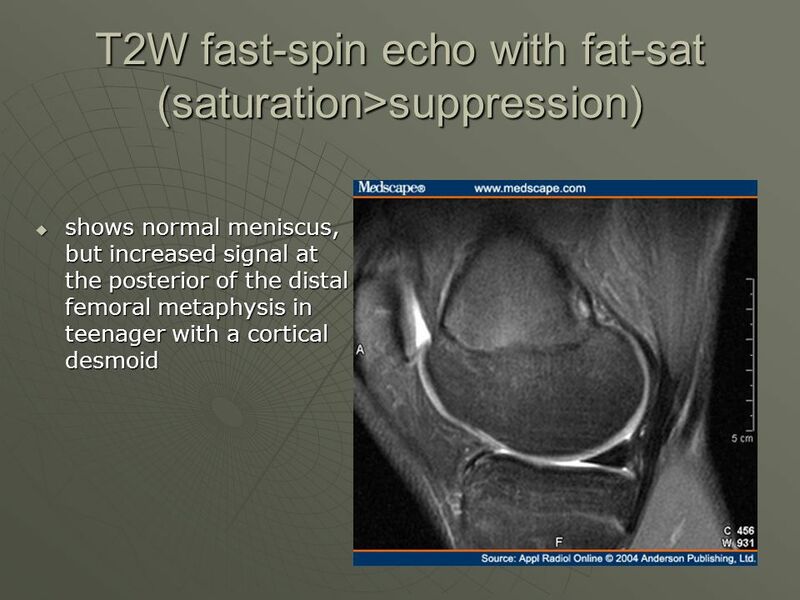 another fine technique for imaging bone marrow pathology and pathology of articular cartilage. 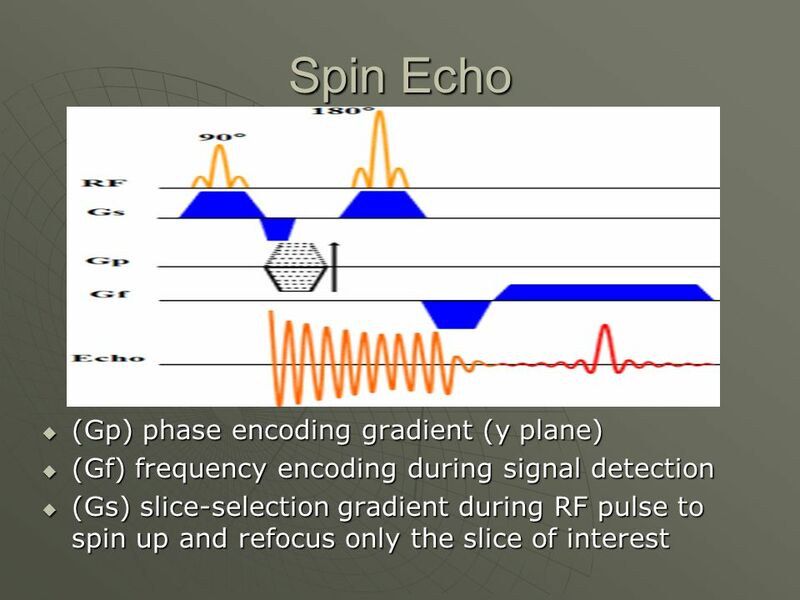 27 3D Imaging This modification of Gradient/ Field Echo, and Fast Spin Echo/FSE, acquires data for imaging as a block or cube rather than as slices. 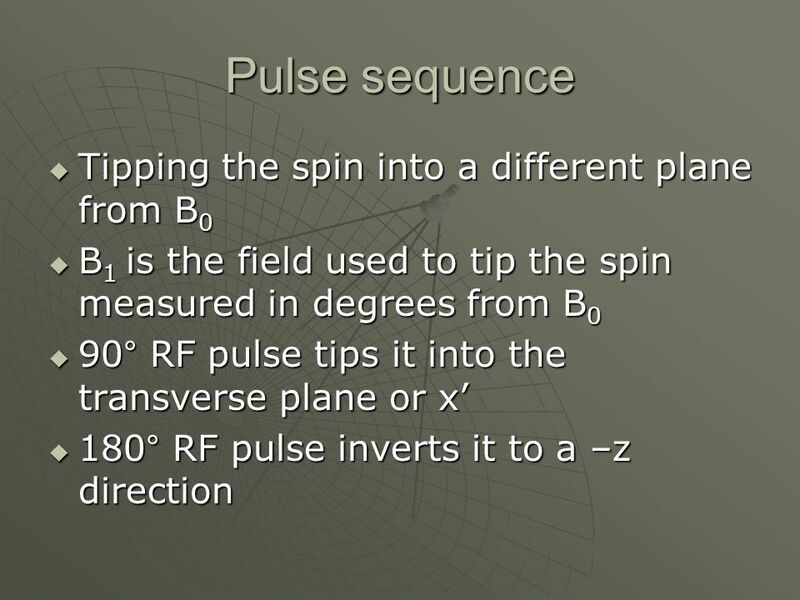 The data can later be “cut up” into slices of any thickness in any desired plane. 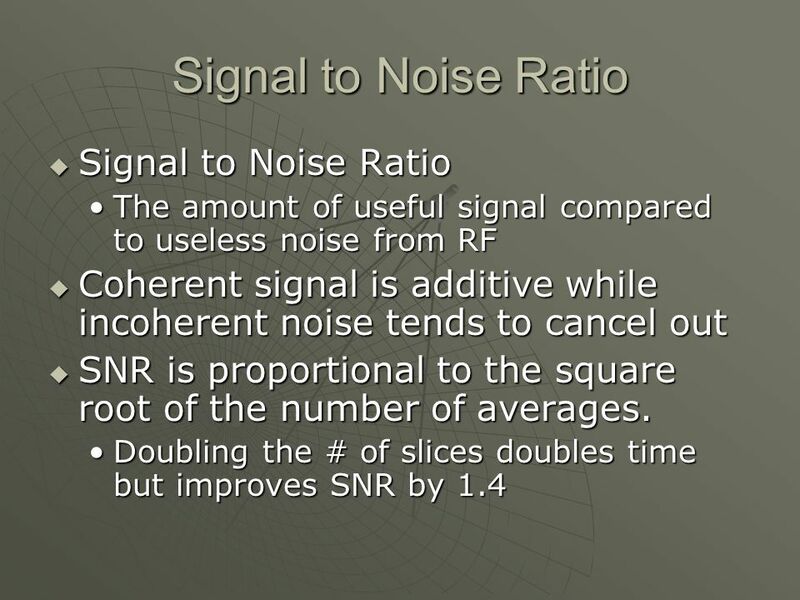 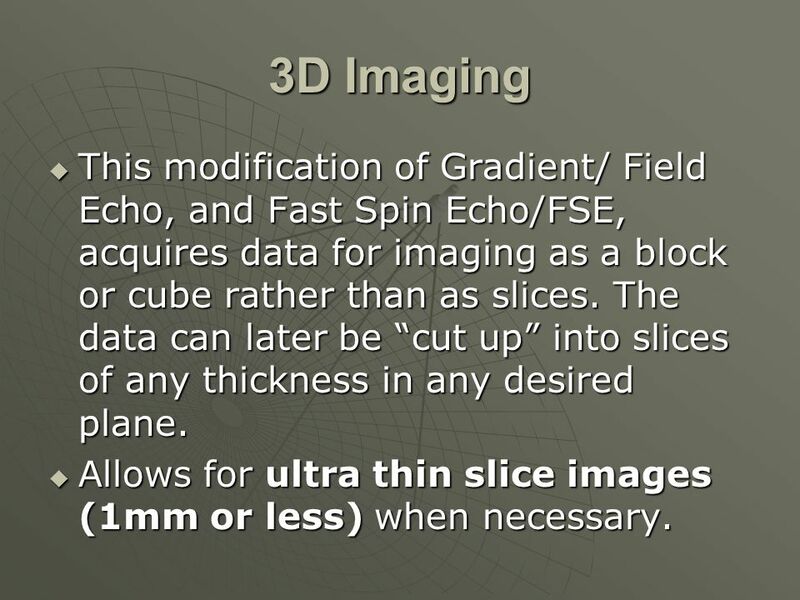 Allows for ultra thin slice images (1mm or less) when necessary. 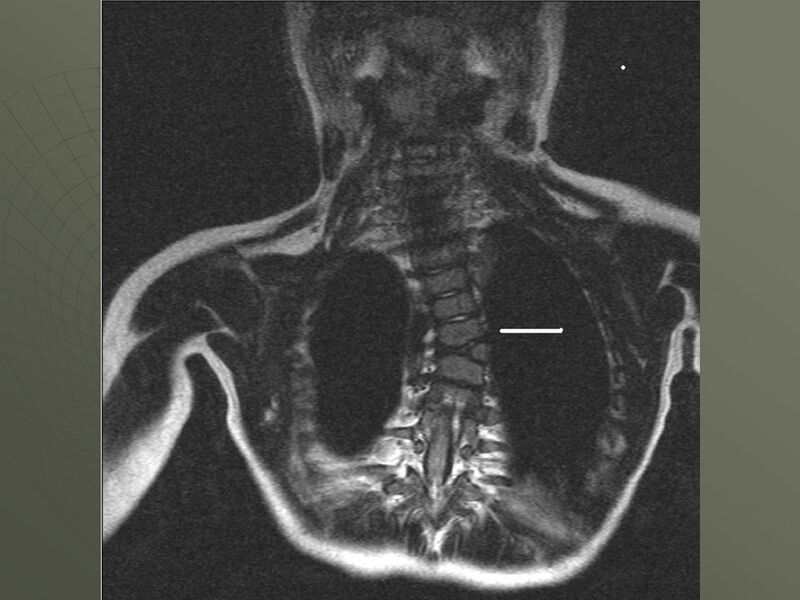 28 69 yr old patient presented with loss of consciousness. 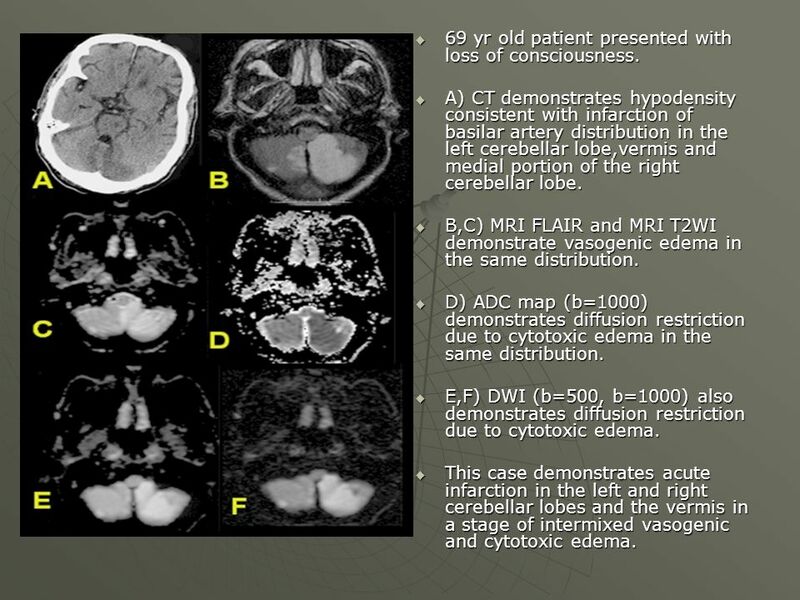 A) CT demonstrates hypodensity consistent with infarction of basilar artery distribution in the left cerebellar lobe,vermis and medial portion of the right cerebellar lobe. 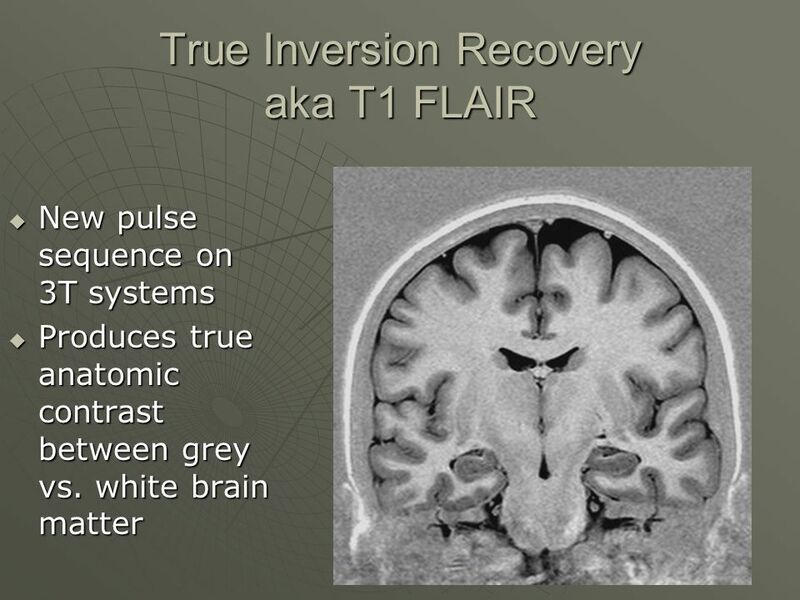 B,C) MRI FLAIR and MRI T2WI demonstrate vasogenic edema in the same distribution. 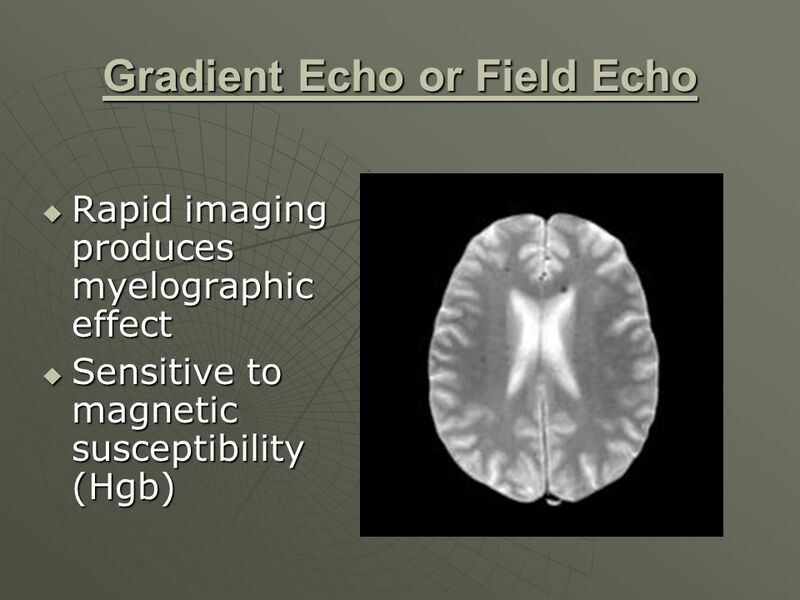 D) ADC map (b=1000) demonstrates diffusion restriction due to cytotoxic edema in the same distribution. 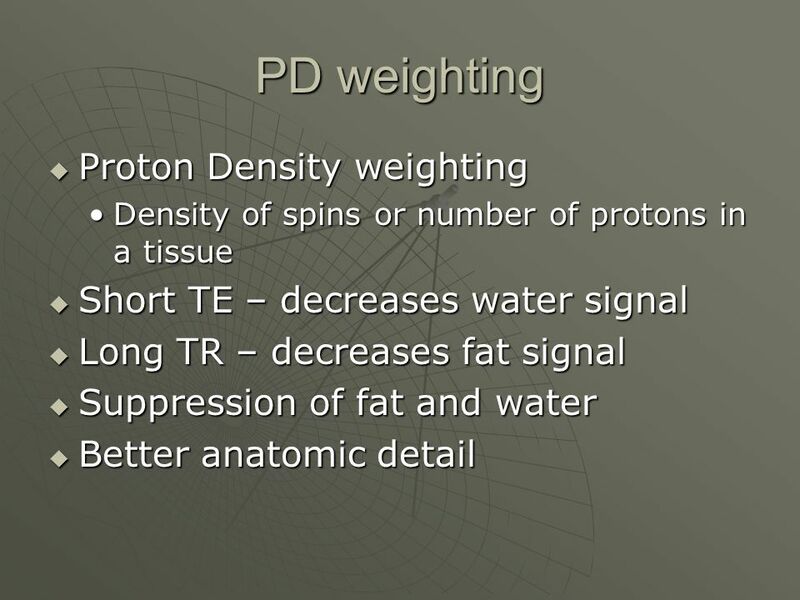 E,F) DWI (b=500, b=1000) also demonstrates diffusion restriction due to cytotoxic edema. 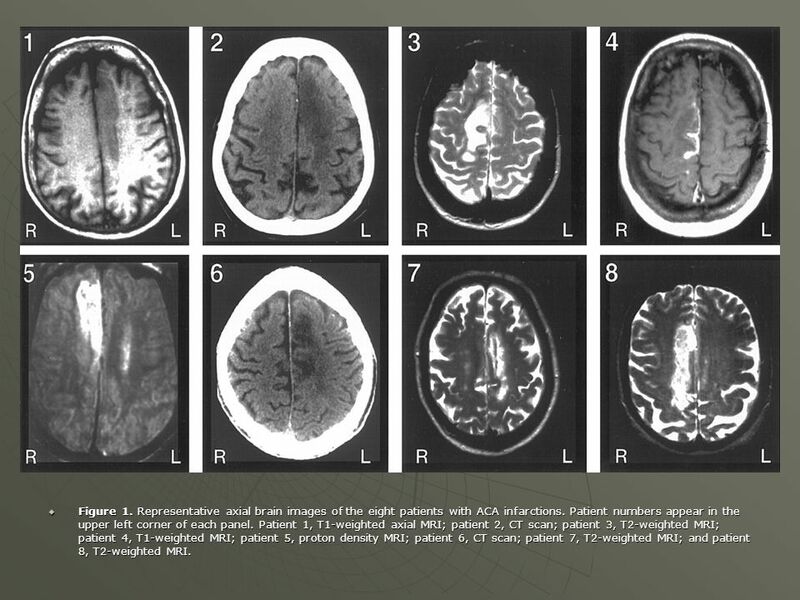 This case demonstrates acute infarction in the left and right cerebellar lobes and the vermis in a stage of intermixed vasogenic and cytotoxic edema. 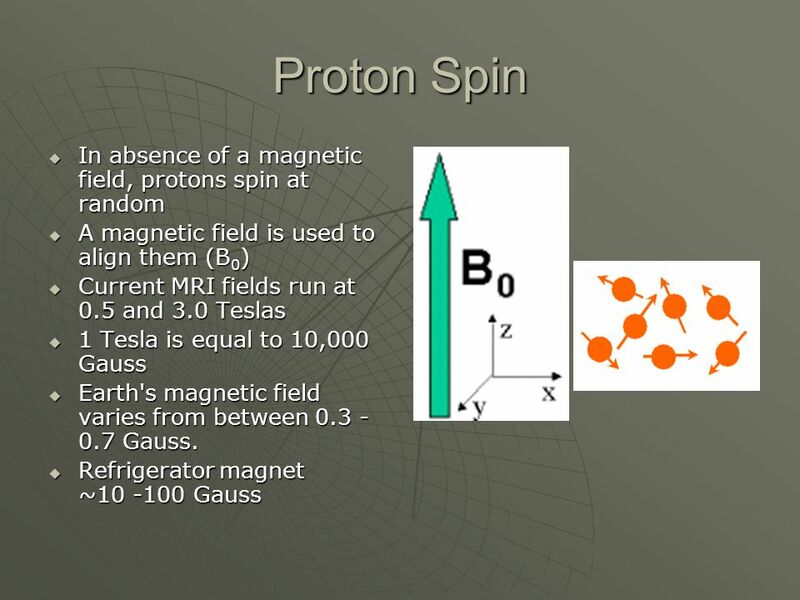 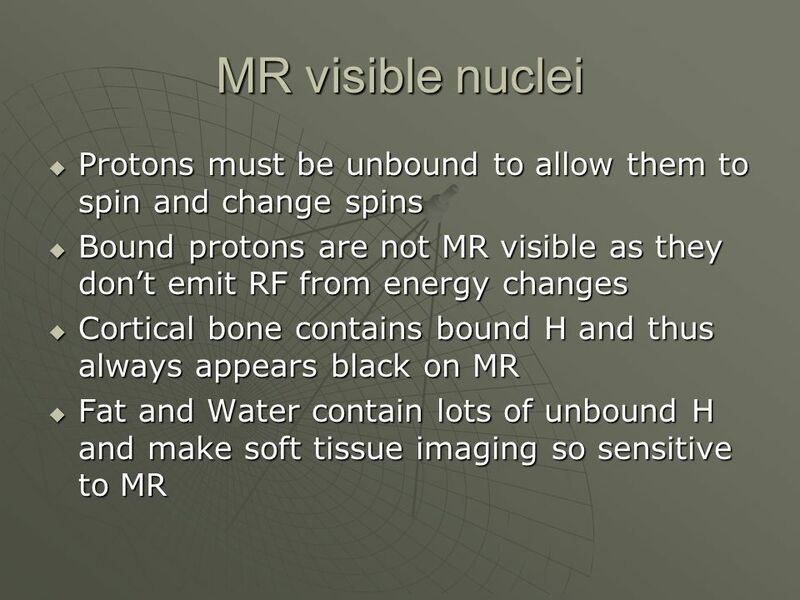 Download ppt "Proton Spin In absence of a magnetic field, protons spin at random"
Principles of the MRI Signal Contrast Mechanisms MR Image Formation John VanMeter, Ph.D. Center for Functional and Molecular Imaging Georgetown University. 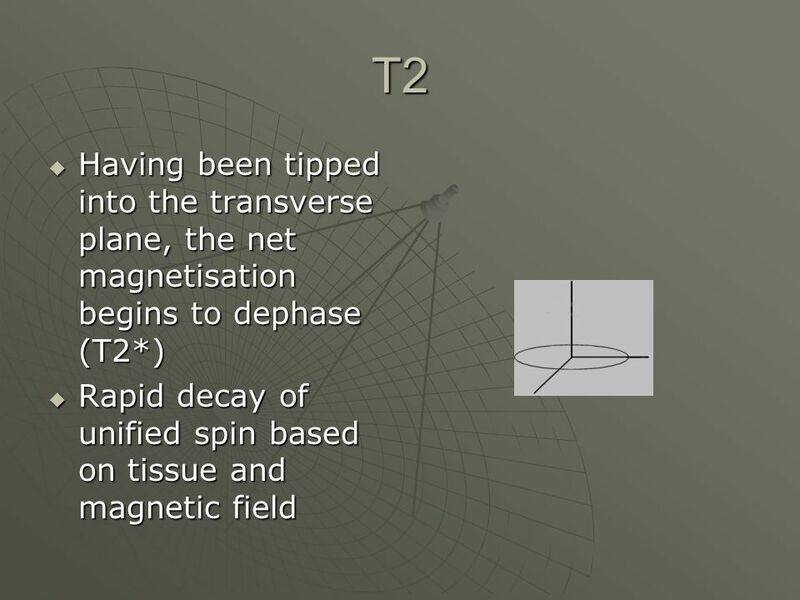 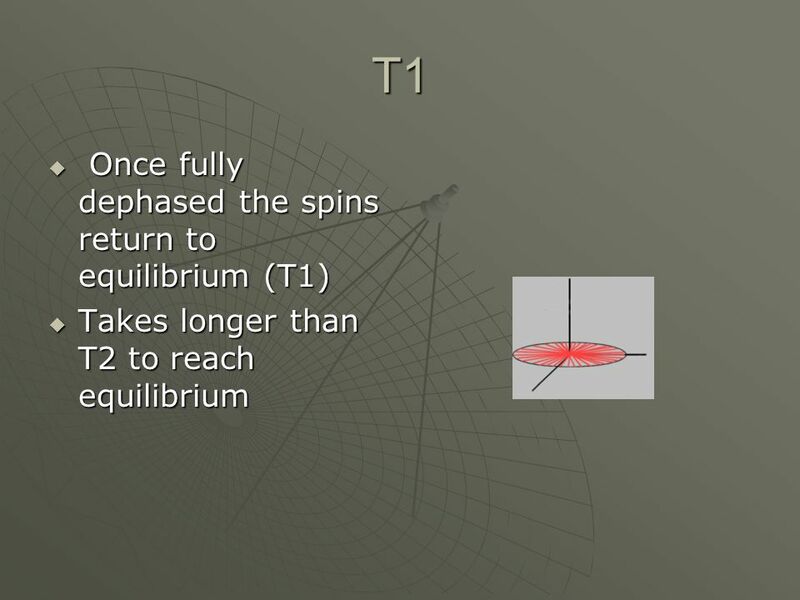 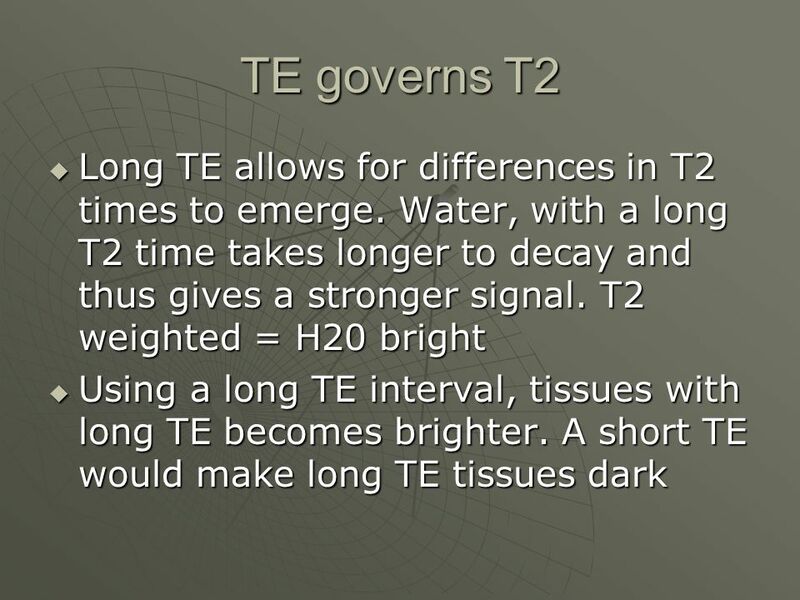 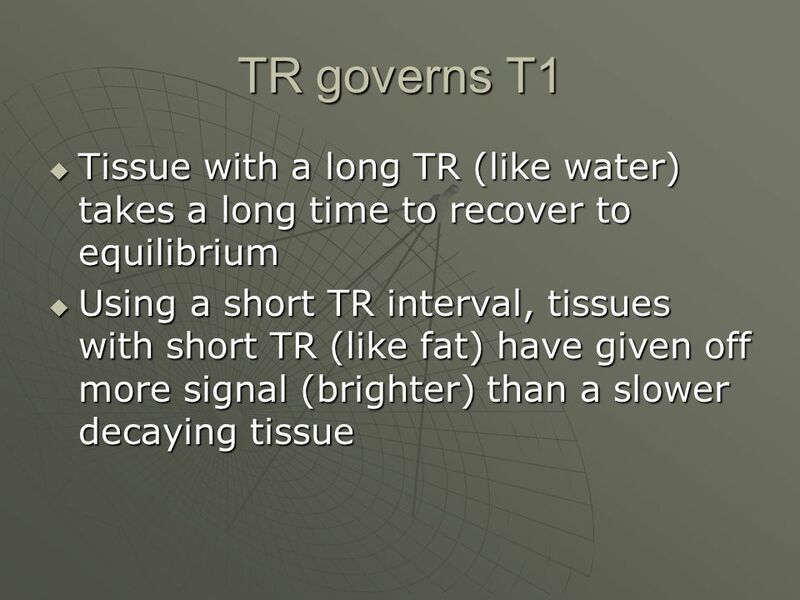 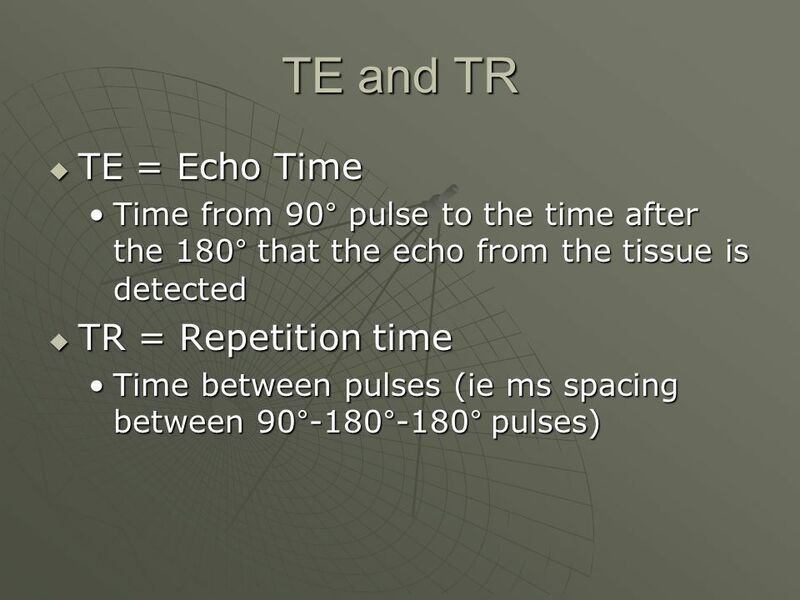 PULSE SEQUENCES Emphasizing the differences among spin density, T1, and T2 relaxation time constants of the tissues is the key to the exquisite contrast. 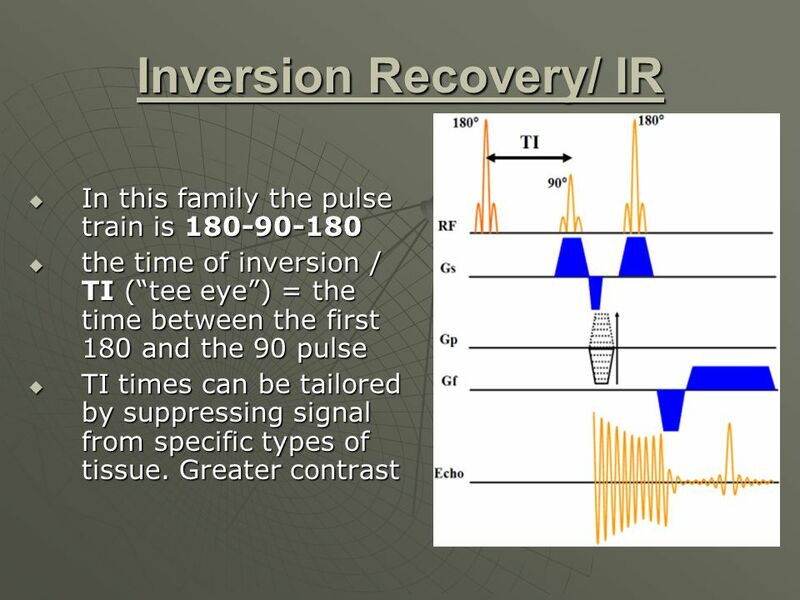 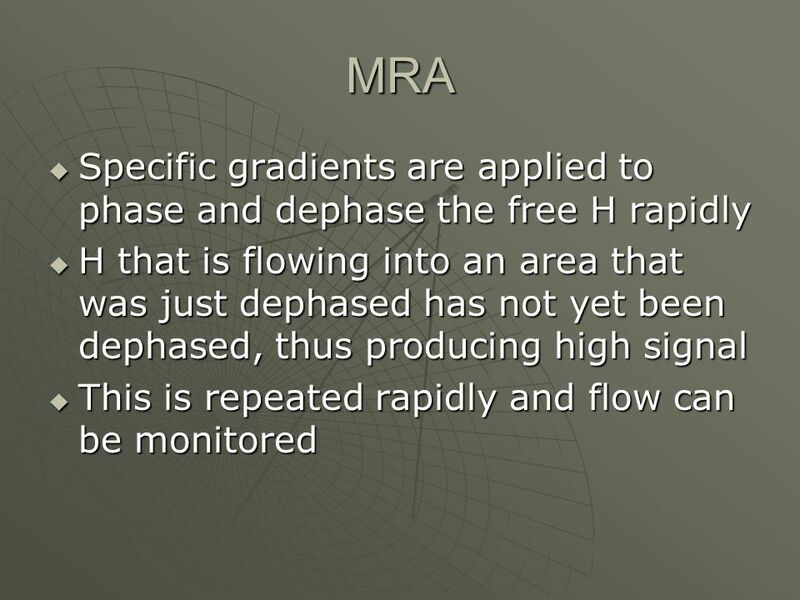 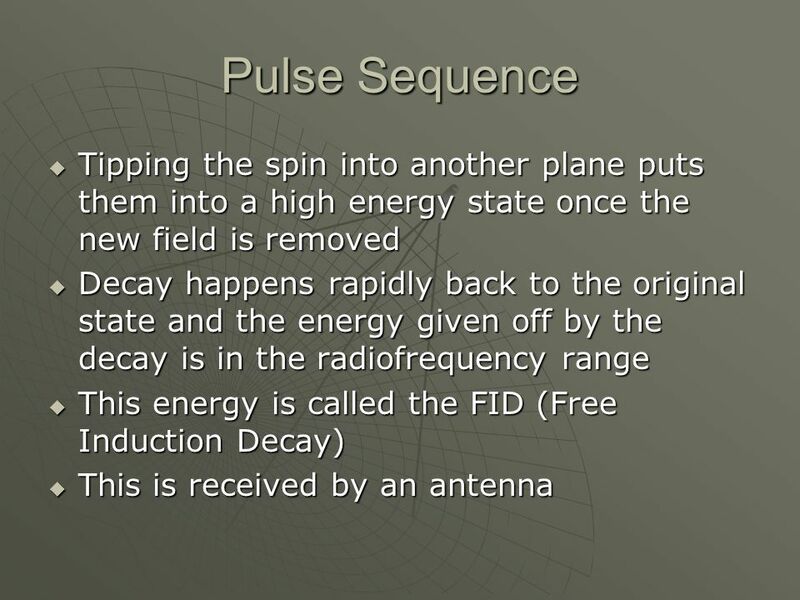 M R I Pulse Sequences Jerry Allison Ph.D..
BE 581 Lecture 3- Intro to MRI. 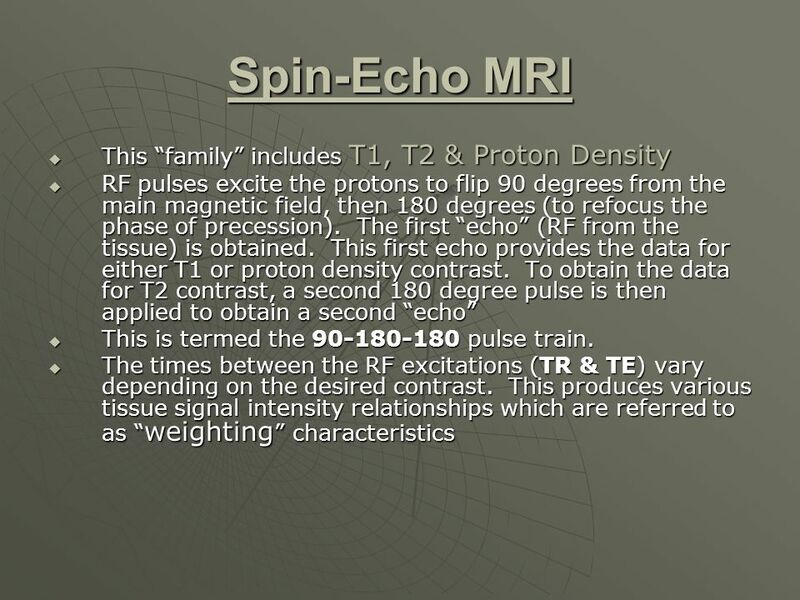 Institute for Biomedical Engineering EXCITE Afternoon Hands-On MRI Sessions: fMRI & DTI.